At Happy Tails our goal is happy, healthy dogs. Period. We know how important your pets are to you because we are dog owners and dog lovers ourselves. We take pride in welcoming each client into the Happy Tails family and building relationships that last. We strive to be as flexible and accommodating to our clients as possible. We account for last minute walks, late and early walks and weekend walks. selected to make sure they are a perfect fit. Pictured: Ella, Cookie, Bogie, Randi, Noga & Ruthie. "There is no better break in the workday than Brian's daily post-walk text telling me with a lot of humor my little man had a good walk. Brian is great about scheduling around my work travel and administering my pets meds when needed. He walks my 2 dogs and my sister's dogs and they love him. Was referred by a friend and would highly recommend." "First and foremost, Brian and Ryan are both pet lovers! 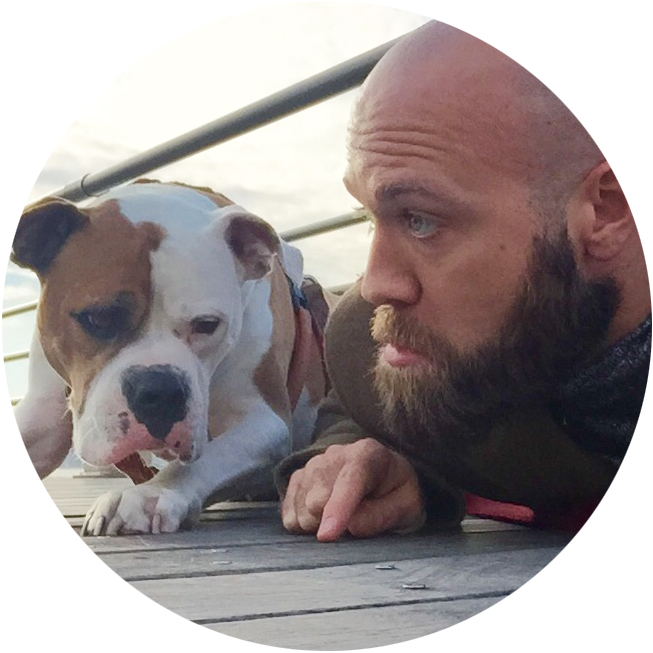 Their immense admiration for our furry companion is reflected in their attention to detail, timeliness and warm updates during a scheduled walk or overnight slumber party with my American Bulldog. They both have helped me out in more than my fair share of those emergency last minute late nights at the office/gotta stay for a deadline scenarios. My pup and rugs are immensely grateful! Would trust them with my own child if I had one, so in lieu of, I whole heartedly trust them with my 75lbs of pup!" "Brian is amazing. I moved to the city from Boston and was worried my boy Rocco would have trouble adjusting to city life. But Brian was wonderful with him and I'd come home from work to find a very relaxed and happy dog. My roommate was home a couple times and said Rocco would always be very, very excited to see him! They are very responsive, excellent at communicating, confirming days and times of walks. Can honestly highly recommend them!" "Brian is the best!!! Lucky and Riley have a ton of energy and look forward to their daily walks. After an hour with Brian they are happy and tired out. Happy Tails is always flexible with their schedule and have accommodated all walk times and last minute requests."